A guest talk was jointly organized by the Department of Microbiology and Medical lab technology under the Faculty of Allied Health Sciences on 17th November 2018. 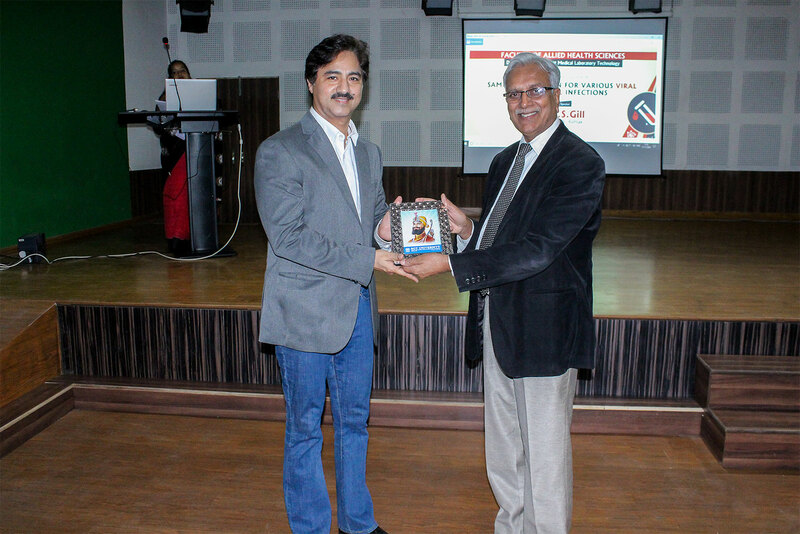 The title of the talk was “Sample collection for various viral and bacterial infections” which was delivered by a microbiologist of repute Dr. Paramjeet Singh Gill, Prof. Microbiology, PGIMS, Rohtak. The respected speaker was welcomed by our Dean, FAHS Dr.V.K Govila who presented him with a sapling on behalf of the University. The occasion was graced by Dr. Shyam Lal Singla (Pro-Chancellor SGT University) who presented the guest with a memento as a token of love and gratitude. He also shared a few words of wisdom with our students. Students of M.Sc and B.Sc Medical lab technology, B.Sc Microbiology as well as M.Sc medical microbiology students were part of the audience who witnessed the talk. The guest speaker gave a detailed and informative description of recent techniques in sample collection. Emphasis was given on quality assurance, quality control, pre-analytical errors, need for proper transportation and storage as well as rejection criteria of the clinical samples. The talk concluded with a very interactive session between the speaker and the students where a lot of their queries were handled with sage by the speaker. The students were highly satisfied by the elaborative and energetic pace of the talk and requested for more such talks to be held in the future.